Made by Philips in Austria, the VHS 63 is externally identical in all but colour finish to the machines they made for Decca, GEC and others. All are based on the Philips VR6462. As a concession to B&O style, the buttons are covered by hinged plastic doors, and a sombre matt black fascia and dark grey top cover are fitted. Text copyright © Beocentral. Unauthorised reproduction prohibited. Inside, differences are confined to the addition of an extra panel so that the machine can be controlled remotely using a Beovision Video Terminal, instead of the Philips RC5 system. Although fairly basic, the specification never the less includes automatic tracking (the first use of such a system on a B&O recorder since the demise of the V2000 range) and DNR audio noise reduction. No specific Beovision was recommended for use with the VHS 63, but the finish and specification partner it well with the grey version of the 5102/7102. 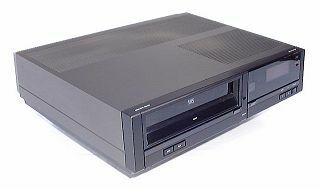 Beocord VHS was replaced by Beocord VHS 82. Text copyright © Beocentral. Unauthorised reproduction prohibited.